Social Media has evolved a lot in the last decade and it has become more than just socializing platforms. Companies have used Social Media channels such as Facebook, Twitter for reaching out to their audience and build engagement. But since it’s a two-way communication channel, it has also opened the doors for consumers to complain and reach out to companies. And that’s why it has become very crucial for organizations to provide customer service on Social Media channels as well. Now companies which are providing multi-channel support to their consumers include social media in consideration as this has a huge impact on their brand image, sales & customer loyalty. Expectations of consumers are rising and they are looking for an experience like no other. It is no secret that your customers are on Social Media and to connect with them you need to be there too. Social Media channels have evolved their algorithms in such a manner that it shows users what they like. It means if you’ve not posted in a while or it hasn’t got engagement in the recent past, then you’re tend to get lesser it in future. So, you need to be not only present on Social Media but also needs to be active. You can increase the engagement by asking questions or by launching some contests. This will help you reach out to your customers, more they see you better will be the brand recall. If your customers are not talking about you, try to include yourself in conversations which are related to your industry. While trying to include, make sure that you’re adding some value and this way people will tend to include your brand while talking online. A report by Conversocial states that 88% of consumers are less likely to buy from a brand which does not answer on Social Media. I think this stat says a lot about consumer behavior online. Consumers connect with a brand only when they see that they’re valued. When a customer sends a complaint online, they expect you to feel their pain and be kind to them. 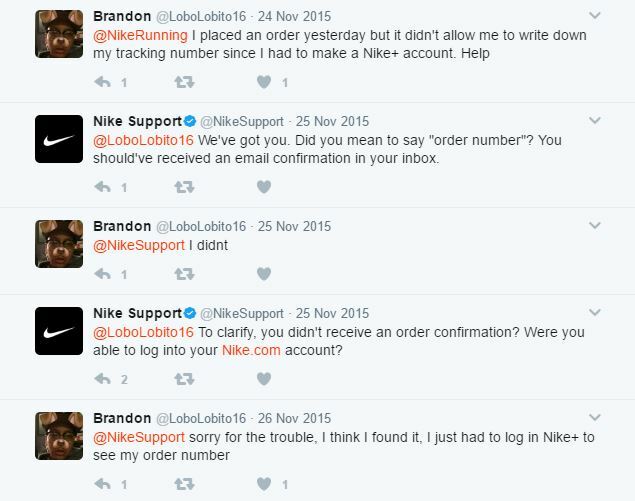 When a customer posted an unclear question on Twitter, Nike’s customer support made the customer feel cared. They have a dedicated account on Twitter, just for the support and provide it 7 Days a Week in major languages. When the customer was answered in a kind manner for not having all information by himself, he felt great and reverted in a positive tone. No wonder Nike’s customer support team scored full marks on that. In this fast-moving world of social media, consumer’s expectations are on the rise and they want their query to be handled as quickly as possible. In a study conducted by Edison Research, they found out that 42% of consumers who attempt to contact a brand, product, or company through social media for customer support expect a response within 60 minutes. And 32% expect one within 30 minutes! Consumers are more likely to connect and recommend a brand which gives them a quick and effective response than a brand that gives them a slow and effective solution to their problem. And still, brands do not understand the urgency of their customers. 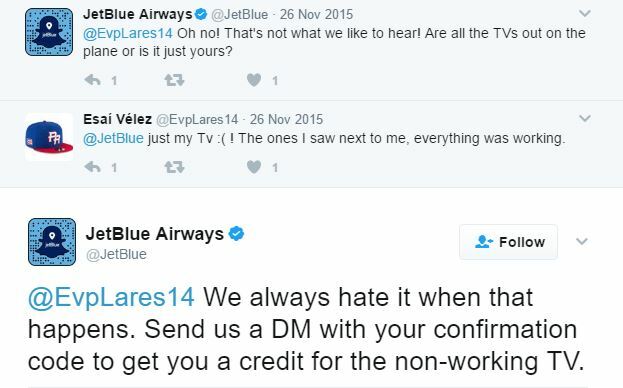 Let me share an example where JetBlue. 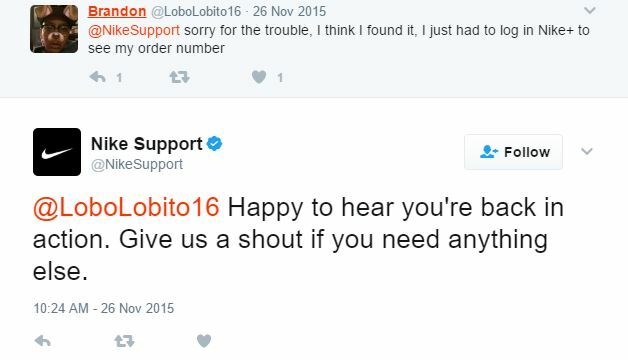 While this example was of Twitter, you can provide a great customer support experience on Facebook too by offering your customers live help on chat. Since, consumers want quick responses a live chat solution will help you interact with them in real-time via Facebook messaging feature. I’m sure that will make your customers happy. Since, the amount of customer queries depends on your company and industry it can range from just a few to more than thousand. Some companies find it difficult to handle. You get queries on your website and social media too. And using social media for customer service can be very difficult if you’re a growing company where you have to entertain a good consumer base within shortest span of time. Here, I would suggest you to use a single platform for handling all your queries coming on website & social media as well. By including a live chat platform like REVE Chat on your website, you would be able to handle all your queries in real-time. And the good news is that you can integrate it with your Facebook Page & Viber account as well. After the integration, you’ll be able to handle all queries from your Facebook messenger, Viber account and website from a single dashboard. By now, I hope you have understood the importance of providing customer support via social media channels. It helps you in not only reverting quickly to your customers, but also in making them feel cared and connected. If you know more examples like these, please do not hesitate to share them with me in the comments section below. Your thoughts on this article are also most welcome.